Real Steel has been the #1 movie in the country since it opened last week. We haven't seen it yet because I was worried the PG-13 rating and live action would render it too scary for Jasper (never mind that my parents took me to see Jaws when I was his age, when we had just moved to Hawaii and I was about to start swimming lessons…) but a bunch of friends who've gone said that both kids would really enjoy it, so I think we'll go this week. Jasper has been obsessed with robots since he was a baby, so I am sure he'll be totally engrossed. Roo would probably enjoy it more if Hugh Jackman sang and danced, but I don't think there are any musical numbers in Real Steel. (And there's no way mommy's taking her to see a rehash of a certain '80s movie that kind of sucked even back then. I mean, a town that forbade dancing? C'mon…) Anyway, the whole family can agree on the awesomeness of robots. See more clips on the Real Steel YouTube Channel. 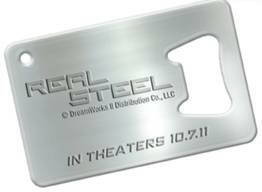 To enter and win a Real Steel gift pack as shown above, please comment on this post with your favorite robot or boxing movie. Entries will be accepted through October 21st and I'll pick the winner using Random.org. US/Canada readers are eligible. Leave an extra comment letting me know what you did for each additional entry. I loved the robot in Short Circuit! I follow Real Steel on Twitter. I "Like" Real Steel on Facebook! Also, I follow @superdumb on Twitter. I have faved you on Technorati, too! Seriously, I think Real Steel is my favorite boxing/robot movie.It was really great! 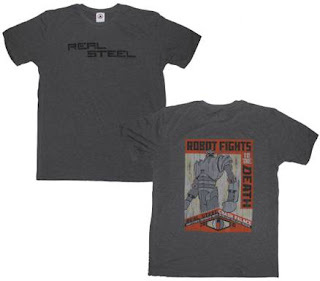 I like Real Steel on Facebook! I'm a subscriber in Google Reader! Transformers is my fave robot movie!